The new year always brings with it a flurry of enquiries and this year is no exception! As usual I'm getting lots of enquiries about one design more than any other - I call it "Lady Godiva", but the cake world calls them naked cakes. Loads of cake, loads of fruit - delicious. 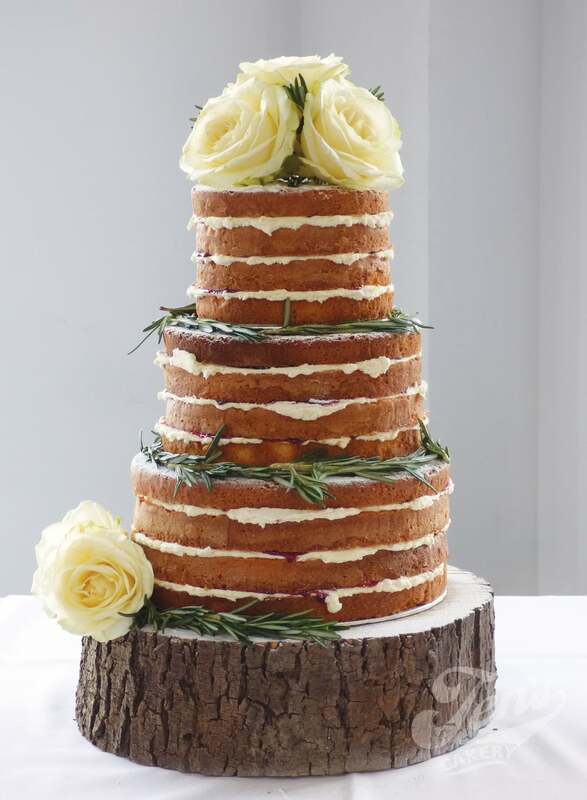 This naked cake looks beautiful with just sprigs of rosemary and fresh roses. Doing away with the flowers and adding some greenery with sprigs of mint amongst the fruit. Whilst most naked cakes are round, I think square works just as well. It's fine to have different flavours of cake. Naked cakes are as popular as ever, and it's not hard to see why. All your guests will be love it: the ones that love eating cake, the ones that like cake to look like cake, and the ones that want to see something really different. They are quirky AND traditional, all at the same time, and they look soooo delicious! Lots of people don't want iced cakes. They've been put off sugarpaste (aka 'fondant', the smooth icing most cake makers use) by those supermarket birthday cakes with a thick wodge of sugarpaste on the top. These naked cakes are perfect for you, sugarpaste haters. However, in defence of icing, I usually tell clients that my cakes don't have a big slab of icing on the top, it's much thinner - I'm not mass-producing these things like the supermarkets do so I can take the time to make it nice. Also, once the cake has been cut each slice only has a tiny bit of icing on the top so it doesn't dominate. But if you're still anti-icing, go naked! Mmm, Cake. What flavours work best? 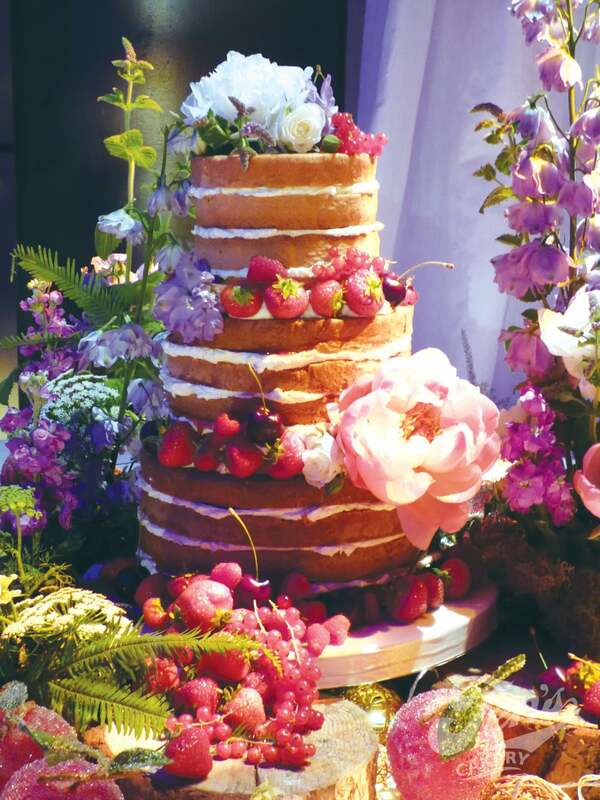 For me personally, I love naked cakes to be a traditional jam-and-buttercream cake, like a viccy sponge. I like the way the jam oozes out of the sides! So I'd go for a combination of vanilla ad raspberry, and strawberry and champagne tiers. I make lots that totally mix and match the flavours, too, and you can see from the pics above that they look fantastic too - so anything goes! Fruit? Flowers? How should we decorate it? I love them decorated with fresh fruit and fresh flowers. I supply all the fruit, and I'll ask you to order your flowers from your florist. Obviously, they can't be toxic flowers! The flowers sit on top of the cakes but they are in contact with cake you'll eat, so if you hate the idea of fresh flowers on cakes (some people do, and that's fine!) then just stick with the fruit. You can see it still looks fab! Either way, I'll set the cake up and arrange all the fruit and/or flowers on it. I have never worried about this. I bake them at the very last minute, and use great recipes that really aren't dry, and I set it up as late as I possibly can for you. They don't get a chance to dry out! Sure, if you baked it a few days in advance, or set it up the night before, it wouldn't be nice, but I'm not going to do that. So don't believe all the internet scaremongering, but do select your baker carefully! Not at all, Naked cakes are obviously less work for me than an iced cake covered in sugarflowers, and that's reflected in the price. Yay! Drop me an email!